San Diego Gas & Electric Thursday reminded customers to not touch downed power lines, or anything near them, and to call 9-1-1 instead. 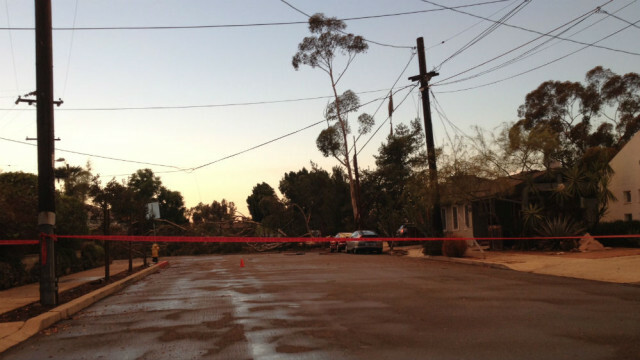 SDG&E has mobilized both its employees and contractors to deal with storm-related problems as a series of potentially powerful storms lined up and began moving through Southern California. Company officials are monitoring conditions via the largest utility- owned weather network in the U.S., according to SDG&E. The firm plans to have full staffing available when the storms are expected to be the most severe. It should be assumed that any downed power line is energized, utility officials said. People also should not try to remove trees or branches that fall onto power lines, and should use a flashlight instead of candles in case of a power outage due to the fire risk. Also, large appliances and other sensitive equipment can be unplugged to prevent damage from lightning-caused electrical surges.